With August coming to a close, how did the Little Terns do this year? The answer is a record smashing success! This year an estimated 155 breeding pairs produced 301 chicks, 289 of which are presumed to have fledged and dispersed from the colony. This has been the most successful season for numbers of pairs and fledglings at Kilcoole since the conservation project began in 1985. Last year's breeding season (2014) was a record year, with at least double the number of successfully fledged chicks than in previous years. The 2015 breeding season surpassed this, breaking the record at Kilcoole again! Although we had great success, it was not all plain sailing: Met Eireann reported parts of Ireland experiencing the wettest May in over 120 years, the coldest May in 19 years and the dullest since 1995. Such adverse weather significantly impacted the colony. The single greatest loss of eggs in 2015 was when 32 eggs were washed out from 17 nests during the spring tide and storm on July 4th, 5th and 6th. Earlier in the season, a tidal surge on June 10th overwashed 11 nests, destroying 29 eggs. The lowered profile of the beach, after the damage done by storms in 2012, has made the colony very vulnerable to the effect of high tides and the weather this season proved to be harsher than the previous 2 years. Despite the heavy egg losses, chick mortality was low. Just 3.9% of successfully hatched chicks are known to have died in 2015. This was generally due to natural mortality, but 3 chicks perished in the awful weather at the beginning of July. 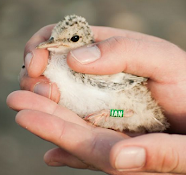 A total of 267 Little Tern chicks were metal ringed this year. Trapping and measuring the chicks gave an interesting insight into the growth rates of chicks. This year, chicks as young as Day 10 and 11 were approaching adult weight, indicating good food availability. As well as metal rings, the coordinated colour ringing programme at Kilcoole continued for its second year. Of the chicks presumed fledged at Kilcoole in 2015, 134 (46%) are colour ringed. These chicks have a green ring on the left leg with a white 3-letter or 3-letter-and-number inscription which are easily visible with telescopes. As they spend their first 2 years of life in West Africa before returning to Europe for their first breeding season, these chicks will not be back until 2017. However, the 2014 batch of colour ringed chicks will be returning to Ireland for the first time next spring. This will be the first time chicks colour ringed as part of this scheme will return to Ireland, so we are very excited to see what rings show up! Be sure to watch out for colour rings in tern flocks returning next April! The trend over the last 30 years (since the protection scheme has been in place) is clearly an increase in breeding numbers at Kilcoole. The success of this breeding season is likely built on the good breeding seasons between 2003-2005 and 2008-2011, as many of the chicks fledged in those seasons have likely returned to Kilcoole to breed. Likewise, the success of 2014 and 2015 will hopefully provide a good base for breeding seasons in the future. First record of one of your birds in Galicia (NW Spain). GREEN ITN was sighted yesterday 31.8.2015 at Ladeira beach, A Coruña, NW Spain by Ana Isabel Pérrez and José Ramón Gómez).